It�fs innovative shape adjusts to the circumference of the pipes and features a highly sensitive Piezo sensor, generous 1.75m lead, 1/4�� male plug and strong clip mechanism with two rubber pads. Being properly cushioned the clip microphone will not damage the wood finish on your pipes. 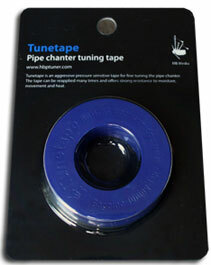 Tunetape is an aggressive pressure sensitive tape for fine tuning notes on the pipe chanter. Purpose made for Bagpipes, it offers superior resistance to heat, moisture, humidity and cold. Each roll is 5 metres * 11mm, very thin so you hardly feel it on the chanter, clear so it's unnoticed by others and can be reapplied many times. Tunetape leaves minimal residue and won't damage your pipe chanter or clog the holes. Tunetape is no ordinary tape, it is unique for the use on Pipe Chanters. It outlasts any other chanter tape available. Using Tunetape for fine tuning and making adjustments is easy. The tape is strong, flexible and movements to the smallest millimetre are possible. Also, by adding pressure when reapplying increases Tunetapes aggressive hold on the chanter. Once in place, Tunetape's resistance to movement reduces those unwanted slips during performances and it's actual 'feel' on the pipe chanter won't interfere with finger movements. You won't even know it's there and birls will flow easily! It's the ideal bagpipe accessory to make the tuning process easier. Gone are the days of electrical black tape slipping or feeling chunky gaffer tape between your fingers! The HBT2 Digital Bagpipe Tuner & Metronome correctly displays the pitch of each chanter note to harmonise with the drones. It features a large LCD screen so display the note, frequency, pitch position and calibration frequency so you can precisely tune your chanter. The HBT2 Bagpipe Tuner & Metronome correctly displays the pitch of each chanter note to harmonise with the drones. On the large LCD the note, frequency, and calibration frequency along with pitch position is shown so you can precisely tune your chanter. It features a large calibration range so if your chanter is low or high pitched it can be calibrated. Simply play Low A, press the up or down button to adjust the calibration frequency then start tuning. It�s ideal for anyone worried about tuning their pipes and perfect for pipers of any standard. It�s also a great learning tool. This small hard case safely stores the HBT-3 Bagpipe Tuner. It�s modern, stylish and protects your tuner from bumps, scratches and dust. It�s lightweight, sturdy and most importantly looks good. 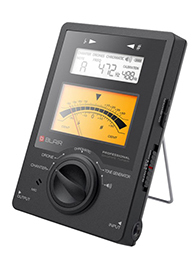 Blair Professional Bagpipe Tuner is easy to use. It's easily positioned, can be removed within seconds and makes tuning your pipes so much easier by having the tuner right there in front of you! The tuning bracket, 'blowpipe' mount is available for the HBT2 & HBT-3 Bagpipe Tuners. The 'tuning bracket' was originally designed by Donald Blair many years ago for attaching a tuner to bagpipes. It's 'hands-free' tuning. The bracket is available for the HBT2 & HBT-3 tuners. The tuner slides into the bracket and is securely fastened by a velcro strap around your blowpipe stock. It won't damage the wood on your pipes and makes tuning easy! Small compact digital Bagpipe tuner for Highland Bagpipes. Easy to use! To tune bagpipes with the HBT-3 all you need do is play Low A, calibrate the tuner then start fine tuning your chanter and drones. The HBT-3 Bagpipe Tuner will display when a note is sharp or flat and when in tune the LCD changes colour from amber to green. Additionally, the HBT-3 Bagpipe Tuner has an adjustable needle speed so if a reed is misbehaving and hard to maintain at a steady pitch, the adjustment allows a tollerance for the best possible detection. The HBT-3 Bagpipe Tuner is small enough to put in your pocket or sporran, gentle on batteries and has an auto-off function when not used for 5 minutes. 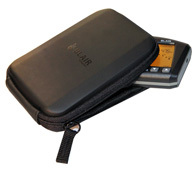 It�s a powerful small bagpipe tuner, perfect for pipers at home to check their chanters before a gig or band practice. � Dual speed needle style meter, allowing control of how fast you would like the needle to move. � Single Hz movement between -10 & +10 Hz of the calibration frequency- for absolute accuracy. � External Bagpipe clip microphone also included. � Auto Shut off after 5 minutes of no use. � Soft padded contacts so it won�t damage your pipes. The mount is made of up of 2 components- a silicon rubber strap with multiple tensioning positions and a soft plastic coated bracket for the HBT-3 Bagpipe Tuner to slide in. The coated bracket won�t damage the wood on your pipes or move about once it�s secured.